What a great turnout for the August Greater Atlanta Coin Show, just WOW! First, thank you to all the visitors for choosing to join us on a busy Sunday. Second, thank you to all the dealers for filling the bourse with their numismatic treasures and other collectibles. Next, thank you to our security and to the hotel's staff. We also need to thank the Marietta Daily Journal for including an article in their newspaper, both print and online, titled, "Minted Treasures Take a Shine to the Greater Atlanta Coin Show This Week" by Sally Litchfield. We had many visitors mention the article - some new to the show and some returning visitors - thank you all for reading and joining us at the show. Many people did their part to make the August bourse an interesting and busy place to be. You are all appreciated. Outside, the weather presented a nice day with temperatures in the low 90s. And, have you noticed? The sunlight is changing, coming at an angle and not as strong as mid-summer. But, it still makes for beautiful days with clear blue skies and white puffy clouds. For our brief look into some of the treasures at this month's coin show, we will mention several nice, complete sets of coins that were displayed. The first set included all of the Barber or Liberty Head half dollar coins, all in a high grade. The US Mint produced the Barber Half Dollar coins from 1892 to 1915 at the Philadelphia, Denver, San Francisco and New Orleans mint locations. Not all of the mint locations struck the coins every year, but a complete set would have over 70 coins not counting proof versions. With its Liberty Head design, many people refer to the coin as the Barber Half Dollar since Charles E. Barber, Chief Engraver, designed both the obverse and reverse. Obverse: Lady Liberty with a crown of laurel leaves on her head, the motto "In God We Trust," and Barber's "B" initial at the base of her neck. Reverse: The eagle's wings spread out to the edges of the coin, hiding the letter "e" in the words "United" and "America." Note: Barber Half Dollar Coin images courtesy of the US Mint. Also, per the US Mint, people did not particularly like the half dollar's design, yet the coin remained in circulation for more than 25 years after the Mint stopped production. 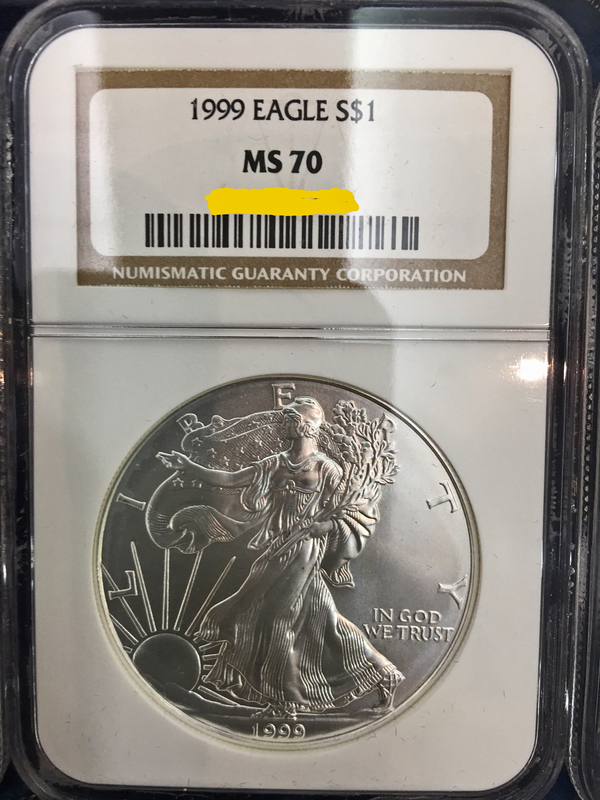 The next full set consisted of all the Silver American Eagle coins from 1986 through 2016 in NGC MS-70 certified holders. The perfect coin. Has very attractive sharp strike and original luster of the highest quality for the date and mint. No contact marks are visible under magnification. There are no noticeable hairlines, scuff marks, or defects. Eye appeal is attractive and outstanding. 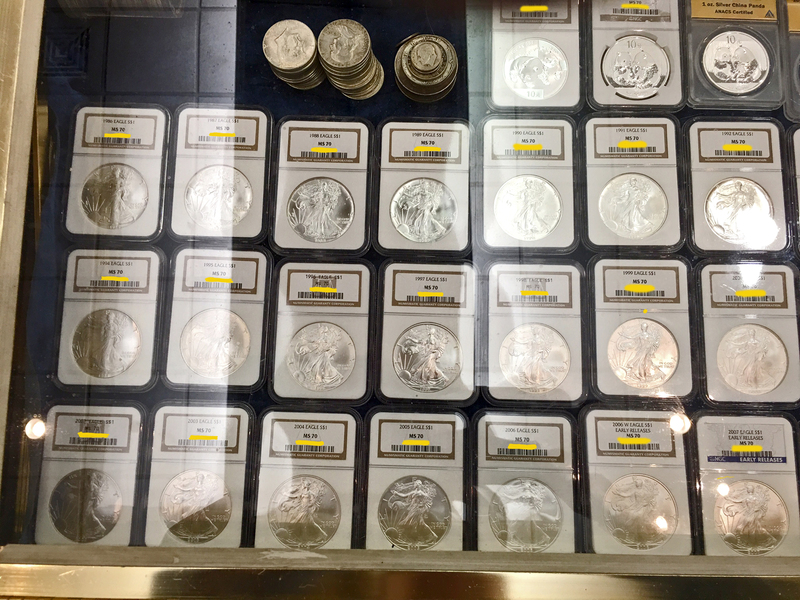 Take a look at this grouping - not all of the 30 or so coins are visible, but this image certainly portrays the nice display. Here's one of the "perfect" coins, a 1999 minted coin with Adolph A. Weinman's Liberty walking into a new day on the obverse. Of course, John Mercanti's heraldic eagle is on the reverse of all the Silver American Eagle dollar coins. Staying with silver, the next complete set included all of the one-ounce Chinese panda coins, both uncirculated and proof, from 1983 through 2016. For the first three years, 1983-1985, the Chinese pandas included .90 silver with a mintage of only 10,000 in proof condition. In 1987, they minted the coins of sterling silver, .925 fine. From 1989 onward, the Chinese panda included .999 fine silver in each one-ounce coin. The obverse designs varied from year to year but always included a panda, whereas the reverse included four different designs of The Hall of Prayer for Abundant Harvests in the Temple of Heaven throughout the span of years. 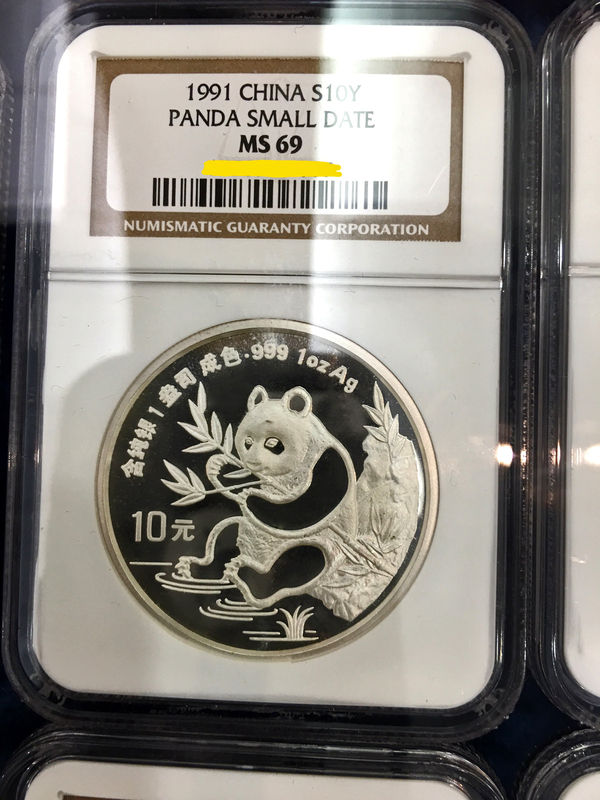 This example image shows the 1991 version of the silver Chinese panda in an NGC MS-69 holder. Has very attractive sharp strike and full original luster for the date and mint, with no more than two small non-detracting contact marks or flaws. No hairlines or scuff marks can be seen. Has exceptional eye appeal. In 1991, their mint produced 100,000 uncirculated and 20,000 proof of the one-ounce silver panda coins. Last on our coin list for this month is a 1993 Philadelphia set. The US Mint designed and minted this set to commemorate the bicentennial of the first Philadelphia mint begun in 1793. 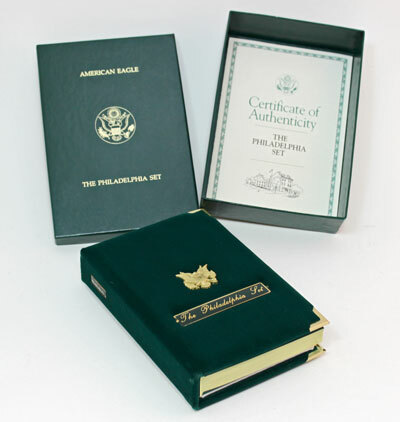 Looking at their historical production numbers, the US Mint made 12,689 of the Philadelphia Sets. 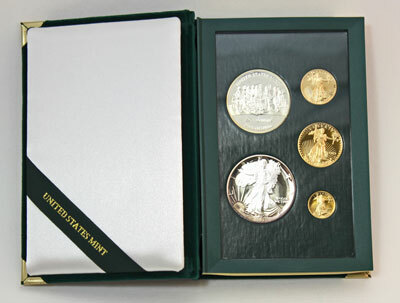 A green box protects the set of three gold coins, one silver coin and one silver medal in their green velvet book. The proof coins included the $25 half-ounce gold, the $10 quarter-ounce gold, the $5 tenth-ounce gold and the $1 one-ounce silver, all minted at Philadelphia for the first time that all were struck at that mint location. Collectors of the early years of the panda coins enjoyed low mintages. In 2001, they increased their bulk uncirculated production to 500,000. In 2010, their mintage exceeded six digits at 1,500,000 uncirculated coins. In 2011, their predicted uncirculated mintage was three million while they actually struck six million panda coins. More recently, their bulk uncirculated silver panda coin mintages have been eight million. Of course, there are gold versions of the panda coins using the same designs in a gold format. They began minting the gold panda coins in 1982. They also minted five platinum versions that year, which are rare and valuable. That's the brief tour for this month. Next month, the coin dealers will again pack the bourse with their displays of coins (ancient to modern, US to world), currency, bullion and other collectibles. Mark your calendars to visit the next monthly Greater Atlanta Coin Show on Sunday, September 11, 2016. The gold American Eagle coins show the Liberty design by Augustus Saint-Gaudens on the obverse and the eagle reverse design by Miley Busiek. Though larger quantities of the gold and silver eagle coins were struck that year, the Philadelphia medal's mintage quantity remains at 12,689, making it more rare. This medal weighs 0.76 ounce and contains 90% silver. In other words, this is a beautiful set showcasing the gold and silver coins minted at the bicentennial of the Philadelphia Mint and honoring the 200 years of effort with a beautiful medal.